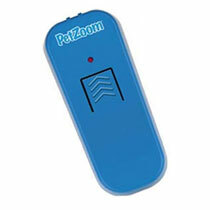 The Pet Zoom Sonic Pet Trainer lets you train your dog or your cat to behave. It is a simple and easy to use solution to train your pet. With the Sonic Pet Trainer you can safely and effectively correct your pet’s bad habits. It is a much more human solution that using a bark collar. The Sonic Pet Trainer works by sending out an ultrasonic pitch to capture your pets attention and get them to stop what they are doing. The ultrasonic sound it sends out is silent to humans but clearly audible to all dogs and cats. It is the same technology used by professional pet trainers. You can use the Sonic Pet Trainer to help reinforce verbal commands such as sit, stay, down, and be quiet. Or use it to teach your pets to stay off the sofa, stop chewing and biting, stop excess barking and more. The Sonic Pet Trainer is battery powered so there are no cords or wires. It is portable, compact and can fit into pockets. You can take it with you when walking your dog. You can order the Pet Zoom Sonic Pet Trainer for only 2 easy payments of $10 plus shipping and handling. Plus with your order you’ll also receive a free Pet Zoom Nail Groom, you just have pay the additional shipping. The Pet Zoom Nail Groom lets you trim you dog or you cat’s nails completely pain-free. You won’t have to worry about them running away or struggling when trimming their nails. 8 Comments on "Pet Zoom Sonic Pet Trainer"
I have 3 Yorkies. Can this be used with more than one dog or would all three dogs hear the same thing? In other words, is there something that goes on the dog too? All your dogs would be able to hear the signal at the same time if they are all in the near vicinity. Is this petzoom harmful to my cat i was trying it but i put it to close to him it was on the side of him when he was getting down from the table is it going to hurt he’s ears? Does this gadget works on all breeds of dogs? I have a Toy Schnauzer & a Teacup Yorkie. I’ll be honest – I was skeptical about the product. But it DOES get their attention. It has been well worth the cost. What is the difference between the Pet Zoom Sonic Pet Trainer and the BarkOff? We have tried similar items and have had NO success, we’re trying to see why the Pet Zoom is successful. I have a sonic pet I use on a 2 year old pug and an 18 month old english bull dog and love it so much I’m ordering a second. I bought a sonic petzoom and like to know what specification of battery to buy for this device.